So how was your pancake day? Did you eat nothing but pancakes all day or did you finish your dinner with a sophisticated sliver of a crepe? Even though mine is happening tonight (fingers crossed that my guests can make it despite the national public transport strike, bloody Italy), I still managed to eat a stack of six (SIX!) American pancakes last night. And that was after my main meal. I was alone in the house, what else was I supposed to do? They were essentially identical to the ones I posted yesterday (and I really can't stress enough how much of a miracle the orange rind, blueberry, maple syrup/honey and mascarpone combination is) but tonight will be a little more varied! The cupboards are full and the camera will be out in force. Does anyone have any fail safe recipes or topping combinations I can try? Unfortunately I don't have access to creme eggs like so many of my Facebook friends (sob sob). So there you have it. And no, I can't go out and get anything more interesting because all of my colleagues have gone for lunch and I don't have keys to lock up. Sigh. At least there's a ghost to keep me company. I keep hearing footsteps but when I turn the door camera on, there's nobody there.... spooky! Working on a post about the beautiful Palermo right now (why is it so difficult to upload photos??) and beginning to think about getting a new design in, possibly by uh.. paying someone else to do it for me. Com'è andato il tuo Pancake Day (martedì grasso ma con i pancake, giorno tipico in Inghilterra!)? Hai mangiato un sacco di pancake o hai finito la cena con un crepe sofisticato? Anche se festeggio Pancake Day stasera (e spero che i miei ospiti possano arrivare, maledetto sciopero dei mezzi), ieri sera ho mangiato sei (SEI!) pancake americani. E gli ho mangiati DOPO una piadina! Cosa dovevo fare? Ero a casa da sola! Erano uguali a quelli di cui ho scritto ieri (non posso spiegare quanto è bella la combinazione di scorza d'arancia, mirtilli, miele/acero e mascarpone) ma stasera avremo più scelta! Ho comprato molte cose, marmellate e nutella e frutta e panna... Avete una ricetta che posso provare o qualcosa da mettere su i pancake? Ho visto molti amici su Facebook con i creme egg (dolce di cioccolato inglese che si compra nel periodo tra natale e pasqua) che mi ha fatto piangere per l'invidio! Sto scrivendo un post della bella Palermo (perché caricare gli immagini è così difficile?) e ho cominciato a pensare a un nuovo disegno per il sito... cioè, penso a pagare qualcuno per farlo per me... hehe. I love dried cranberries (usually the kind sweetened by apple juice) with rocket the sweet tartness of the berries really compliments the bitter leaves. I saw someone make banoffee pie pancakes this year by caramalising a banana and serving it with whipped cream, which I was temped to try. Alas I was back from London to late so I stuck to crepes with lemon and sugar! Ahhh I'd really like a good old plate of pancakes right now! I had them for the first time the year I started living in Ireland and it was instant love, it's one of the many things I miss from that country now that I'm back to Italy :) I must find a good recipe to make some at home! By the way, you have to forgive me Lucy, I deleted your comment by mistake this morning, damn habit of checking messages on my phone when I wake up ;( Thanks for the sweet words! 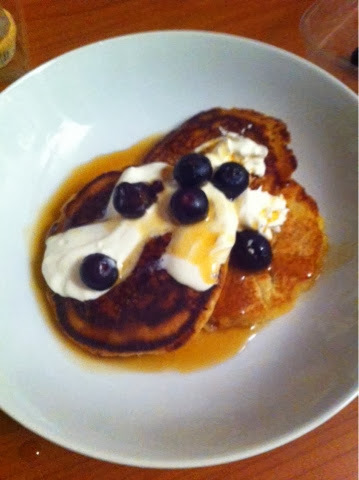 Lovely post - so glad you fully indulged in celebrating the glory of a good stack of pancakes! Although I have to agree ... no Olive Oil readily available in Italy?! Seems like a sin! There is nothing I would love more than a good stack of pancakes right now! Six pancakes is impressive! If you're going to eat them that's how it should be done! No olive oil in Italy? That's the epitome of irony right there!